NOTE: This kit is compatible with 58MM lenses only. Not all Canon cameras come with 58MM lenses. Please verify your camera's lens thread size before ordering. Your camera's lens thread size will be marked somewhere on the lens barrel or printed underneath your lens cap. This number is always preceded by a "Ø" (diameter) symbol. For example: Ø58 = 58mm lens thread size. 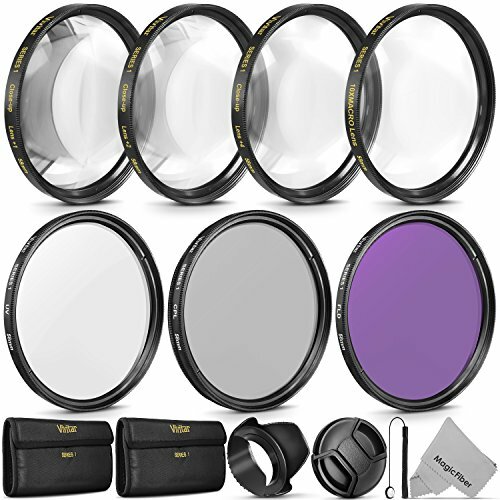 - CPL filters (Circular Polarizer) are great for removing unwanted reflections from non-metallic surfaces such as glass or water. Take richer scenic shots and notice improved clarity in distant objects by cutting through haze and increasing color saturation. - Kit includes 4 close up filters of increasing magnification. - These filters are double threaded allowing additional filters, lenses, or attachments to be mounted on top. - The addition of a lens hood can help prevent flares-those circles of light that can accompany images where a strong light source is just outside the frame. - Professional tulip shape design (also known as 'flower' or 'petal' shape) allows for greater versatility. - Protects your delicate lens from dust, dirt, and scratches. - Easy to use. Simply pinch the center to quickly attach to the front of your camera lens. NOTE: This kit is compatible with all 58mm lenses. Please verify your camera's lens thread size before ordering. Your camera's lens thread size will be marked somewhere on the lens barrel or printed underneath your lens cap. This number is always preceded by a "Ø" (diameter) symbol. For example: Ø58 = 58mm lens thread size. View More In Filter Sets. If you have any questions about this product by Goja, contact us by completing and submitting the form below. If you are looking for a specif part number, please include it with your message.